——————————————————————— This is Weibo’s official iPad app. 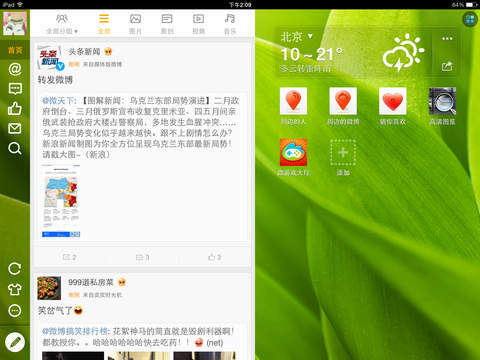 Join Weibo and embrace the new lifestyle! ——————————————————————— This app of Weibo is specially designed for iPad users, hence it really enhances the user experience by its efficient use of every pixel on the big screen. You can read, post, comment, repost, send private messages and follow in Weibo. Also you can easily share every piece of news around you with your friends anytime, anywhere. 【Main Features】 – Keep up to date with the latest global news, topics, pictures and videos by easily following your friends, celebrities and influential people in areas you are interested in. – Easily share ideas, personal updates and news including videos and pictures, and repost those you like with the handy repost function. – Location based services (LBS) allow you to check-in quickly in Weibo, and you can view posts by others in your vicinity – Send voice messages to your friends or followers, share private photos or locations with them by using the private message. – Play music and video in Weibo while continually view posts. – Divide the people you follow into groups (such as friends, classmates and colleagues) in order to easily sort the information you wish to view. 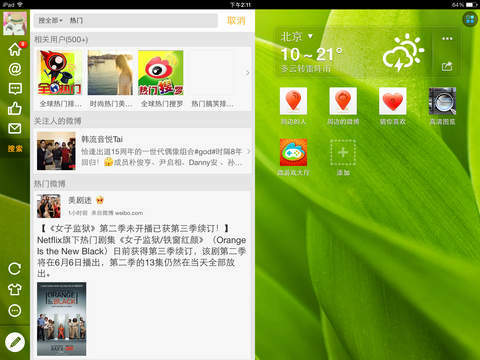 – Find a bigger world in Weibo in the Discover area. – Switch to night mode to protect your eyes in dark environment. – Choose any background image you like to show your own taste. – More wonderful aspects are waiting for you in Weibo. Dating Secrets for POF, OkCupid, Zoosk, Skout, Happn, Match and more!